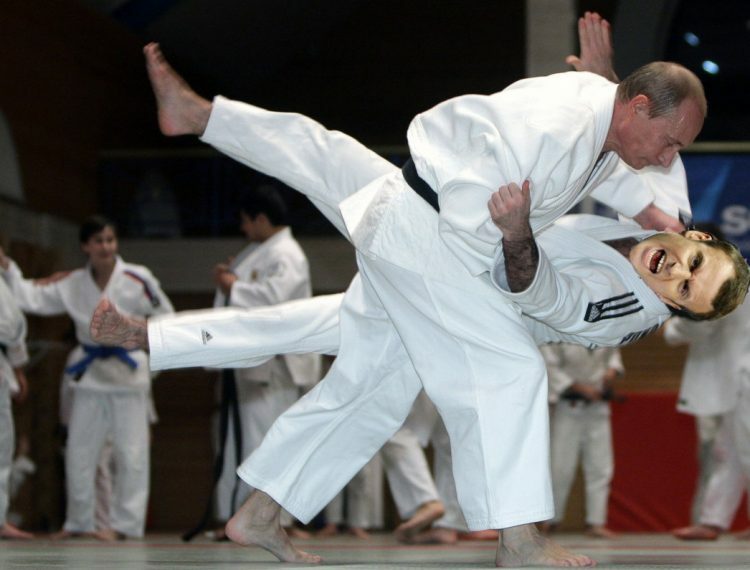 Emmanuel Macron: "Welcome to Versailles Vladimir – Now Put Up Your Dukes"
News newly elected French President Emmanuel Macron is going to get tough with Vladimir Putin when he plays host to the Russian president at the palace of Versailles today. But this just makes France seem downright unfriendly to me. After all, what kind of host threatens a guest publicly even before the guest bedroom is made? When I read the Reuters report on this latest lunacy, it was all I could do not to choke on my morning coffee, in all honesty. Visions of Australia’s Tony Abbott vowing to ‘shirt-front’ Vladimir Putin at the 2014 G20 came to mind. Then I was overwhelmed by the sense Canada’s Prime Minister Justin Trudeau claiming he told Russian Putin to “cease” interfering in Ukraine back in 2015. And what about Macron claiming he showed French resolved in squeezing American President Donald Trump’s hand tight the other day? Brilliant. The genius French President is going to use a Russian historic and cultural artifact to lure Vladimir Putin to Versailles in order to further insult Russians and their president. Macron, who already accused the Russians of trying to interfere in the democratic process during the recent elections, alleging hacking and disinformation campaigning to favor Marine le Pen. Macron’s team banned the accreditation of the Sputnik and RT news outlets which it said were spreading Russian propaganda and fake news. Meanwhile, independent media and influential social media voices were censored with new tools being developed by Facebook and others to comply with the new German and EU anti-propaganda dictates. All during the French election process a number of influential independent media outlets and my own personal Facebook account showed curious and as yet unexplained activity virtually banning thought, to put the situation mildly. The day of the first round of voting in France, a positive Marine le Pen story of mine was disallowed by what appeared to be a URL problem. 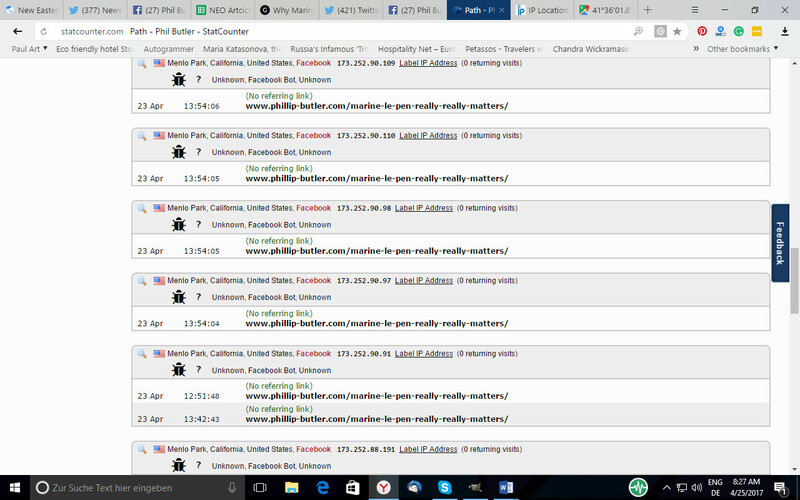 But the presence of a mysterious Facebook bot to my personal blog showed that something more than glitch behavior was going on. I suspected my account was being used as a logical test case, given its influence and longstanding status. A few days later I learned that other moderate voices in independent media had been similarly “attacked”. This is all fodder for a more in depth report to follow, but clearly the French and Germans enjoy being pots calling the kettles black. The crux of all this is that the public in the so-called “west” is “pushed over”. What I mean by this, is that these politicians don’t even have to be good liars anymore. France can admit aiding and abetting terrorists set against Libya’s Gaddafi or Syria’s Assad, and nobody cares. Setting the Middle East on fire, then welcoming boatloads of predominantly male refugees into central Europe, the “Macrons” of Europe are in effect the arsonists burning down European order. And now the public is seduced with more smoke and mirrors into believing this sissy banker can intimidate Vladimir Putin! Let’s see how Macron “shirt-fronting” Putin works out after today.